Indianapolis, Ind. 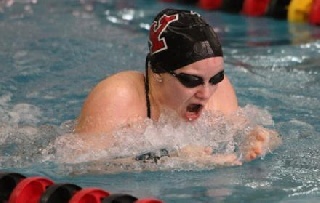 -- Youngstown State senior swimmer Samantha Roberts (Spencer, Ind.) was named the Horizon League's swimmer of the week for her performance at Ohio. Roberts, a senior from Spencer, Ind., recorded two victories and one second place finish in Youngstown State's dual-meet at Ohio on Saturday. She won the 100-breast in a time of 1:08.02 and the 200-breast in a time of 2:25.09. She finished second in the 200-individual medley with a time of 2:18.58. She was the only Penguin swimmer to win multiple events against the Bobcats. The Penguins return to action later this month at the Horizon League Championships in Chicago.